So map data is great and time data is great. And each of those can be interesting on their own. But when you show geographic dispersion through time (or time dispersion within geographic subsets), that movement can go a long way toward facilitating understanding (or at least dimensionally richer insight). Anyways, here's the decade or so of fire data from the recent Major Fires Since 2001 map, veneered off into discrete years and clunkily flipped through in an animated GIF. I should also mention that the reason fires are showing up beyond the US borders is because the data source provides instances within an overfetch buffer. 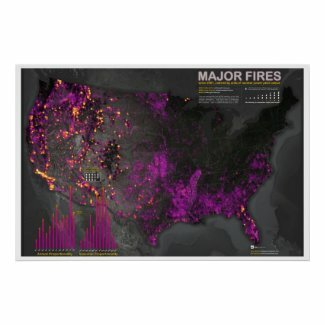 Major fires since 2001. It is pretty big and may take a moment to fully load. The major reason wildfires are uncontrollable - and also, by the way that power outages are much more frequent and long-lasting from so many trees falling on lines - is that vegetation is dying from air pollution. That's correct, tropospheric ozone is highly toxic to plants, just like smoking is to people, and it's killing off trees at an accelerating rate as the background level around the world inexorably rises. People tend to think that the air pollution problem has been fixed but that's not true. Only the sulphur dioxide - the visible part of smog - has been reduced, and the high peaks of ozone. But the invisible, persistant, constant level is going up and up, and traveling to very remote forests, rendering trees unable to combat insects, disease and fungus that are meant to break down dying trees, not attack healthy specimens. http://witsendnj.blogspot.com/2012/07/anagnorisis.html has photos and links to scientific research about what happens to plants, including annual crop yield and quality, when it absorbs the pollution we create by burning fuel and overfertilizing industrial agriculture with nitrogen.